Stanford education professor Jo Boaler’s message about teaching math in visual ways that don’t emphasize one right procedure has become a rallying cry for many math educators ready for a seismic shift in how American schools teach mathematics. But her ideas also challenge much of what has been done in classrooms for decades, including the ways that current teachers and parents learned themselves. Alice Keeler is one of the converted, despite the fact she taught math traditionally for many years. “I was a math teacher, and I’ll be honest," Keeler said, "I didn’t teach it to be creative." She always felt pressure to move more quickly through the curriculum. Every day brought a new topic, whether or not students had deeply understood what came before. When Keeler read Boaler’s book, Mathematical Mindsets, she saw herself as a young student in much of what Boaler described. With tears in her eyes, she told a group of educators at the International Society for Technology in Education (ISTE) that since fourth grade she secretly thought she was dumb because she couldn’t pass timed math tests. Boaler’s message that fast is not the same thing as smart was liberating to her as a person and as a math teacher. “When we work on a math problem, any type of problem, there are five different pathways in the brain that light up and are working,” Boaler said by video call at the same presentation. “Two of them are visual.” She argues that much of traditional math teaching focuses on numerical representations, teachers demonstrating procedures, and memorization, when it would be more effective to try to strengthen connections between the various parts of the brain needed when working on math. “That comes about by showing information in different ways,” Boaler said. Representations of math problems using words, images and numbers each use different parts of the brain, so the concept gets hardwired in a neural network drawing on multiple brain faculties instead of one numerical pathway. “The least likely way of helping kids have those brain connections is having kids sit and listen to lectures,” Boaler said. That doesn’t mean all math classes need to be project-based or that direct instruction is always bad, but when lecture is the default classroom mode, it doesn’t require students to use their brains to make sense of the new ideas. Boaler’s website YouCubed has many activities to help teachers learn to open up the exploration of math from one of closed questions with a right and wrong answer, to one where different ways of seeing and articulating math are valued. When teachers ask students to explain why their thinking makes sense, students are forced to articulate their thought process, how it compares and contrasts to ideas peers have shared, and in doing so may help the teacher identify any misconceptions. A simple example of opening up math in this way starts with a closed question: Divide one by two-thirds. But rather than asking students to apply a rule, ask students to come up with a visual proof. “What happens is the kids have these amazing discussions with different visual proofs, and it’s such a great way of taking a very closed question and opening it up,” Boaler said. As a math teacher Alice Keeler loves the ideas on YouCubed and readily admits most of them can be done without technology. However, Keeler sees many ways that technology could enhance the visual and collaboration elements of the work, so she has adapted several YouCubed activities for the Google Suite. While Keeler spent 14 years in the classroom, she now has her own consulting business and teaches at California State University Fresno. She also co-wrote two books on using Google Classroom with Libbi Miller: 50 Things You Can Do with Google Classroom and 50 Things To Go Further With Google Classroom. “It’s not about being digital and it’s not about being paperless,” Keeler said. “That doesn’t make learning better. But collaboration does.” She likes doing open-ended math activities in Google Slides because each student can play with visual representations, give feedback to peers, and receive ongoing feedback from the teacher. She usually makes blank slides and gives editing power to students. “I ask each student to add their own slides explaining how they did it, how they visualized it, and we’re all doing it together in the Google Slides,” Keeler said. She’s found that when students can see how a peer visualized the problem, they then reflect on different approaches. She also values her ability to comment in real time with students because it becomes a conversation, not a static comment on returned work that the student may or may not look at again. “I can have conversations with them around the ideas and help them to develop their thinking rather than just marking things right and wrong,” Keeler said. A math teacher who isn’t using G-Suite in class could also have these kinds of formative conversations by circling the room and talking with students working in groups, but Keeler likes using the technology because she can easily see how each individual is thinking about the problem. And students can interact with one another’s ideas, even when they aren’t physically in her class. Keeler often tells students not to delete mistakes from the slides, instead telling them to duplicate the slide and keep working. That way she can see the progression of their thinking. This also helps students to see how far they’ve come. A popular YouCubed problem asks students to take exactly four 4s and use any combination of operations to come up with the numbers 1-20. Keeler often does this in Google Slides, where each slide is a place for students to show how they combined four 4s to get “1” and then on the next slide the work for “2,” etc. She likes working in Google Slides because students can add media or even do work on paper and upload an image. This gives different types of learners options. Students with disabilities or who benefit from speech-to-text help can also participate using EquatIO, a Chrome add-on that has voice typing capabilities, as well as handwriting recognition. EquatIO used to be g(Math), and now also makes it possible to use math symbols in slides and other Google apps. Another popular YouCubed activity asks students to visualize division by divvying up a pan of brownies equally among friends. 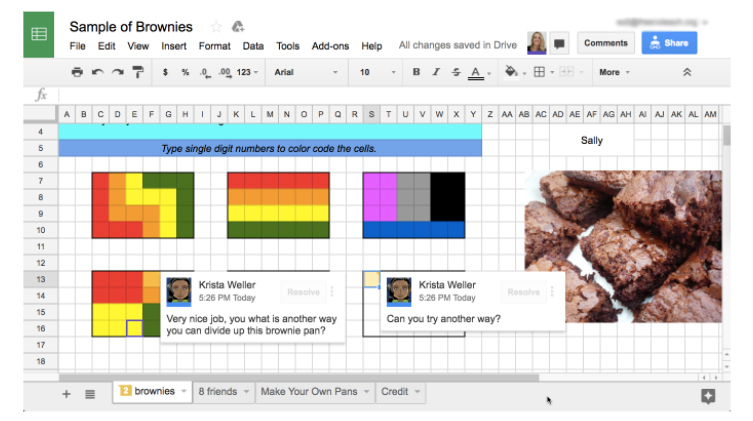 Keeler does this activity in a spreadsheet, and often asks students to create their own brownie pans -- their own problems -- in the next tab. “It allows them to experiment and play,” she said. 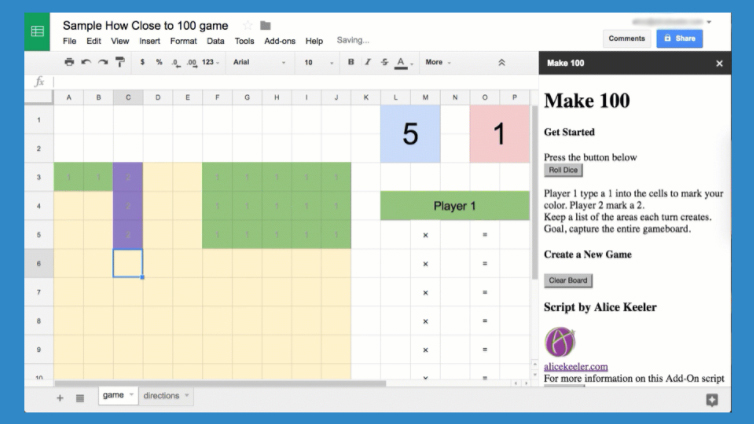 Keeler has become something of an evangelist for technology in math classrooms, learning how to set up conditional statements and even simple code in Google Sheets to aid her purposes (she also shares these ideas regularly on Twitter, including activity templates). Over time her teaching evolved and by the time she left the K-12 classroom she had upended some of the practices she once considered fundamental, like assigning homework. One of the most controversial ideas in math education revolves around how, when and how much students should practice. 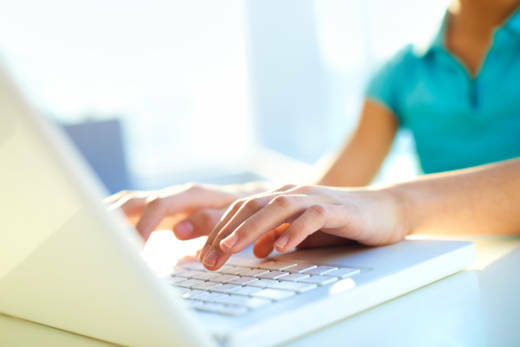 Many teachers believe it is important for students to do homework so they can practice new concepts learned in class. Boaler agrees that practice is important, but doesn’t think that requires doing the same type of rote problem over and over. Boaler explained this to her daughter’s teacher and was pleasantly surprised at how she used the feedback. After their discussion, the teacher started giving students four problems to practice the calculations and then asked them to represent the concept some other way. They could write a story, make a drawing or come up with something else. The key was showing their knowledge in different ways. Ultimately both Keeler and Boaler hope that by making math a subject that’s about ideas, discussion, differing viewpoints and visual representations, students will learn they can not only do math, but excel at it. Too many students don’t feel that way now, which is why teachers are beginning to see the need for a new approach.